Snapshot of the video about Delos. We are happy to announce the launch of our YouTube channel! 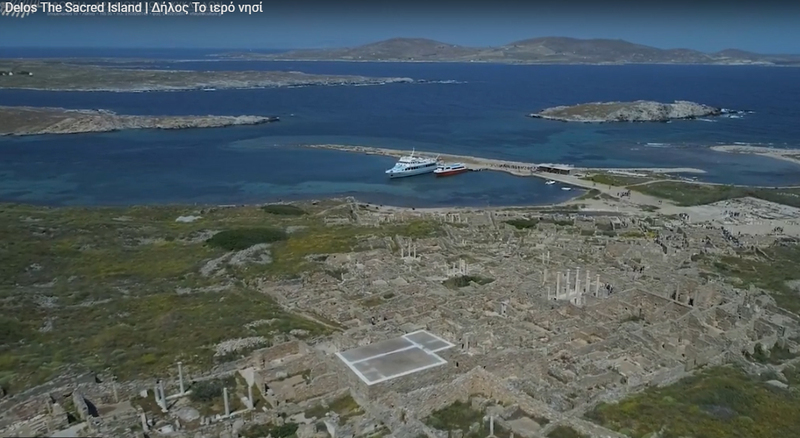 Our first video is about Delos, the Sacred Island. Delos, a long narrow strip of land (5×1, 3klm) is described in poetic texts as a floating rock that was anchored with diamond columns to the sea bed in the heart of the Aegean, when Leto gave birth there to Apollo and Artemis. Round the sacred island of Delos, the islands joined in a circular dance (cyclos), so they were named Cyclades. The first traces of habitation (3rd millennium BC) have been located on Mount Cynthus (112 m). The sanctuary of Apollo, known from Homeric times, was founded in the most protected bay of the island, on the ruins of the Mycenaean settlement (2nd half of the 2nd millennium BC). The sanctuary of Delos bears traces particularly of the presence of Paros and Naxos. The dominance of the latter is depicted in buildings and votive offerings (the House of the Naxians, the colossal statue of Apollo and the Terrace of Lions who are the guardians of both the Sacred Lake and the palm that Leto embraced to bring Apollo into the world). The city that determined the destiny of Delos was Athens. In 478 BC the Athenians founded the Delian League, while in 426/5 BC they carried out a complete cleansing of the island, moving the graves to neighbouring Rhenea and rendering the Delians virtually stateless. Athenian hegemony in Delos is maintained until 314 BC, when the island is declared independent. At the same time, its relations with the Hellenistic states of the East and Egypt lead to further growth. The island’s occupation by the Romans marks a new era. In 167 BC the Delians are driven out for good. The Romans declare Delos a free port, attracting entrepreneurs from East and West. Its population grew considerably, building activity intensified and the economy flourished. Foreign residents outnumber the Athenians. Numerous luxurious residences, markets, sanctuaries and associations of entrepreneurs, merchants and ship owners are established on the island. The sanctuaries of the gods of Ashkelon, of Zeus Hypsistos and the gods of Iamnia are built at the top of Cynthus, next to the most ancient temples of Zeus Cynthios and Athena Cynthia. Further down, next to the archaic Heraion, the sanctuaries of the Egyptian gods are renovated, with the imposing, now restored, temple of Isis, while the sanctuary of the Syrian gods extends further north. On the eastern coast is possibly the oldest Jewish synagogue in Europe. Foreigners are setting up clubs. Poseidoniasts from Beirut identify Baal with Poseidon. The Italians of Delos have the Market of the Italians, monumental in scale, as their main meeting place. Delos’ destruction in 88 BC (the war of Mithridates) was also caused by its being favoured by Rome. Later, the Romans walled part of the city, which included the sanctuary and the theatre quarter. Delos continued to be inhabited until the 6th century AD, although by now there had been a significant decline in trade. Rich houses were turned into craftsmen’s workshops, while the Athenians, who were still officially in charge of the island, tried unsuccessfully to revive the old Delos celebrations. Early Christian basilicas found on the island are evidence of the spread of Christianity. From the 5th c. AD Delos (meaning: visible) is described by wayfarers as adelos (invisible). The ancient glory of Delos is rekindled in the western world’s memory thanks to the Renaissance and travellers. The excavations started in 1873 by the French Archaeological School brought to light important aspects of Delos’ religious, residential, commercial and political past. The Ephorate of Antiquities of Cyclades and its head Mr. D. Athanasoulis for the photography and video recording license. Zozi Papadopoulou for the introductory text. The production is by the Ephorate of Antiquities of Cyclades and the magazine “Archaeology and Arts”. The recording was made at the studio of the Music Technology and Acoustics Laboratory of the Department of Music Studies of the National and Kapodistrian University of Athens. The musical instruments used were reconstructed as part of the “Hermes” project, which is being implemented at the Laboratory of Voice and Accessibility of the Department of Informatics and Telecommunications of the NKUA.